Our second release in cans, canned by Mobile Canning in Longmont, South Ridge is brewed using a recipe I developed almost twenty years ago. An American amber ale is much like an American pale ale, but darker in color, with more caramel flavor, more body and slightly more balance between hop bitterness and malt. South Ridge is made from all American malts: 2 row, crystal and Munich malts, with a touch of carapils. It is hopped with Chinook and Cascade in the boil, with a massive late hop addition (whirlpool) of Centennial, Cascade, Amarillo and Zythos. With its combination of malt and hop flavors and aromas and a slightly dry finish, it is an eminently drinkable beer. 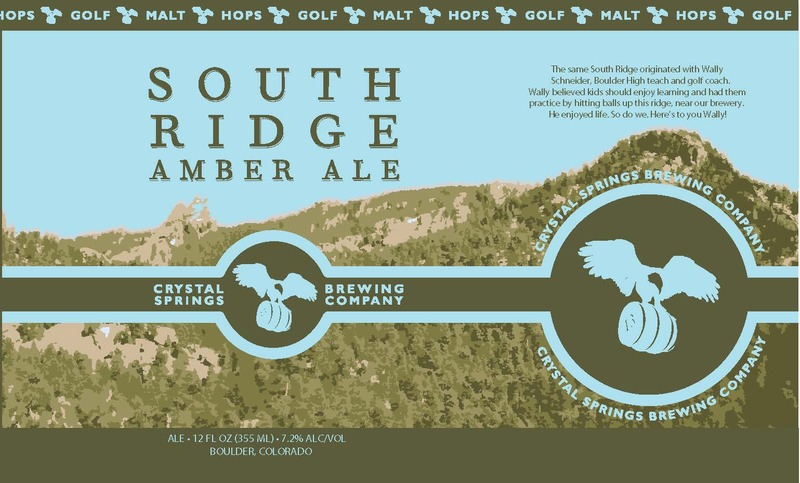 The label for South Ridge is a caricature of the ridge south of the brewery. The origin of the name “South Ridge” came from Wally, Kristy’s late father, who was a famous Boulder golf coach (he coached Hale Irwin in high school). In those days, Wally used to bring his golfers up here and they practiced driving by hitting balls up the South Ridge – hence the “fairway.” The label is purposely made in a cartoon-like fashion because Wally was a guy who liked his students to enjoy learning. He liked to have fun. So do we. Here’s to you Wally!